I think one of Deming’s best quotes is “Profit in business comes from repeat customers, customers that boast about your project or service, and that bring friends with them”. Focusing on your customer value proposition is the basis of achieving this. Focusing on your value proposition is the basis of achieving this. Your value proposition starts and ends with your customers. Spend time understanding their opportunities and challenges, then give them products and services that resonate with them. Business success is fundamentally about delivering customer value, so it makes sense that you should spend time understanding what value means to your customers. People from all areas of your business should be involved in developing your value proposition. Every part of your business should be focused on delivering value to your customers, so first assemble a multi functional team and make sure they understand the key steps in developing your value proposition. Consider different ways to segment your markets based on customer needs as well as traditional demographic segmentation. Consider your route to market and identify your influencers, distributors, manufacturer, contractors and end users. Recognize that each of these ‘customers’ have different needs. Identify your ideal customer profile, these customers will appreciate the value that you offer and deliver higher customer lifetime value and are more likely to engage with you. 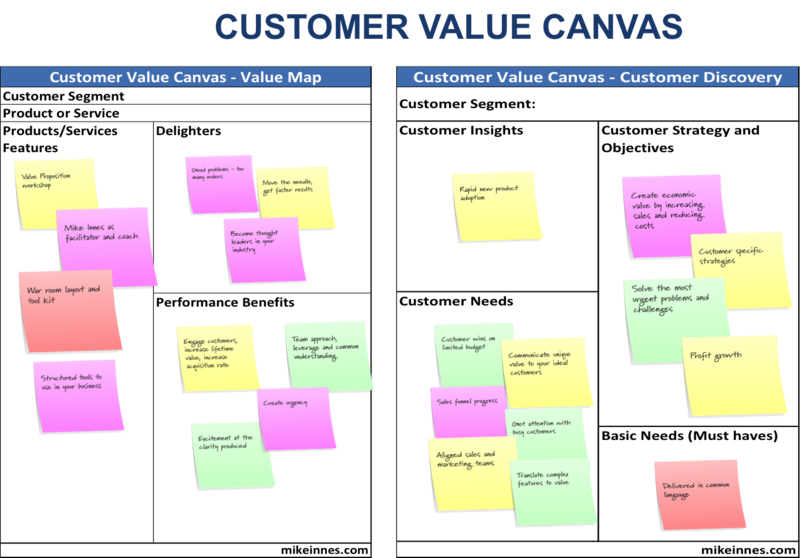 This is the hardest and most important part, the Customer Value Canvas provides a structure for your team to work with and I strongly recommend a facilitator to get the most from the team. Understand the key challenges for the businesses in your market segment. 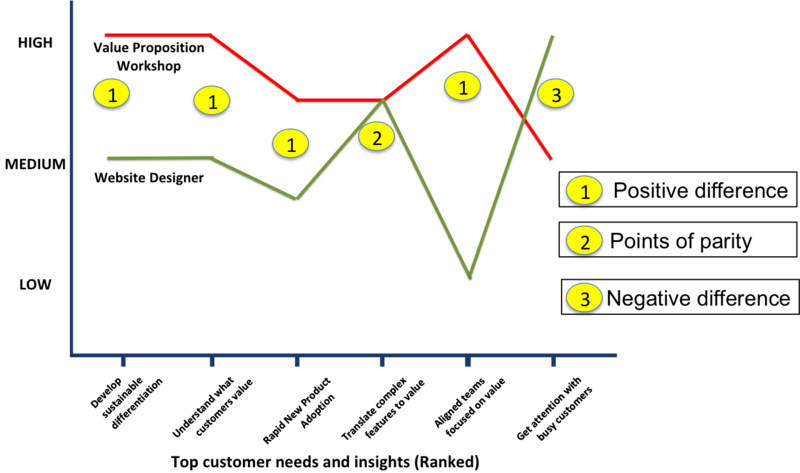 What external and internal factors are affecting the market. What strategy are they adopting? How do they create economic value? The individuals in your customers have specific needs. What does value mean to them, think in economic, functional and emotional value terms. How do they measure success? The key is to gain insights, what do your customers really need (and may not be aware of ). This comes from your team developing a deep understanding of your markets and customers. Moving to the Value Map side of the canvas, once you’ve identified your customer segment’s needs, positioning your products to meet those needs is the easy part. What performance benefits do your products and services offer? They must be relevant to your customers’ needs, if they are not then they are unlikely to be as interested as you think they should be. If you have identified insights in to your customers needs then you have the opportunity to delight them. At this stage, you should have a canvas covered in post-it notes, with customer needs ranked in order of importance to the customer segment, balanced with benefits offered by your products and services and a few key insights in to what your customers really need. I use a Competitive Canvas based on the Blue Ocean Strategy Canvas to develop competitive positioning. 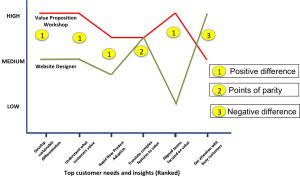 By plotting the ranked needs of your customers on the x axis of the canvas, you can then evaluate your position versus competition. Identify Points of Difference versus your key competitors in areas that are most important to your customers. Identify actions to improve your competitive position where you have negative points, execute on the actions to improve. In today’s competitive world, it is quite likely that you have a number of points of parity with your competitors. The focus then is on proving that you can do what you promise, giving your customers the confidence that they can trust you. With the Customer Canvas and Competitive Canvas complete you can begin to build your value proposition. A value proposition is unique to a target market and product/service that you offer. Define how your product/service delivers benefits to satisfy those needs. Quantify wherever possible, ‘We reduce your costs’ does not cut it. How do you prove what you claim – think customer testimonials and case studies. These need to be strong to back up your claims and convince your customers that they should buy from you. This process will also identify new product opportunities and areas of performance you need to improve on to be more competitive. Make sure you put actionable plans in place, with ownership, to address these areas. Your value proposition becomes a narrative, which promises benefits that resonate with your customers needs, with clear differentiation and proof to substantiate your claims. They then build on that with key pillars (benefits) and testimonials from customers to prove their claims. Zoho have grown from 1 Million subscribers to over 13 Million subscribers in the last 7 years so they are clearly communicating their value proposition very effectively. Having spent time developing what you believe your customers value most highly, you need to go and test it with them. The most important area is to test that you understand what your customer’s needs are and what is most important to them. If you’ve got it right, your customers will be thrilled to discuss it with you as it will be aligned to their needs. Make sure you go about it in a structured way, look for areas to improve your proposition. Developing value propositions is not a one time only exercise, view it as needing continuous improvement just like all the other areas of your business. You now have the foundations for building incredibly strong customer partnerships. Make sure you use your value proposition as the basis for everything you do. Marketing briefs for external agencies, don’t expect your marketing agency to work out your value proposition without your help. The basis for developing and innovating your business model, think how you can deliver value in different ways. Developing value propositions takes time. Think about how many ‘man years’ you spend developing products, on that basis it’s very reasonable to spend a few days developing your value propositions for each of your customer segments and products.